Dr. Bowyer specializes in providing dental implants to patients in the Vancouver, Washington area. He’s done hundreds of successful procedures for patients in Vancouver. We’re ready to help you restore your smile and improve your oral health – contact us today to set up a free consultation! An implant post (usually made of titanium) that is surgically implanted into the jawbone. This serves as a replacement for the tooth root. An abutment. This is a smaller post that connects the implant post with the synthetic tooth. Abutments are semi-permanent – they can be removed and cleaned by your dentist. The crown – this is the visible portion of the dental implant that replaces the missing tooth. Crowns mimic the shape and appearance of a natural tooth. They are usually made of zirconium or porcelain. 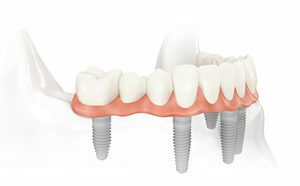 Dental implants are designed as a permanent solution to missing teeth. Over time, the implant bonds with the living bone of the jaw. This creates a durable and secure anchor for the replacement tooth, avoiding slippage that is common with more impermanent solutions like dentures or bridges. If you are missing one or more teeth, dental implants may be a good option for you. Whether you have lost teeth due to injury, disease, or tooth decay implants can provide a permanent solution. Most dental implants replace one or two teeth, but procedures to replace multiple teeth are not unheard of. Dental implants may also serve as anchors to larger dental appliances, such as fixed bridges or implant-supported dentures. Suitability for dental implant procedures varies from patient to patient. If you have had no major dental issues or pre-existing medical conditions, then you are probably a good candidate for dental implants. Pre-existing conditions can affect the viability of dental implants, so consult your dentist if you have diabetes, cancer, or another serious medical condition. 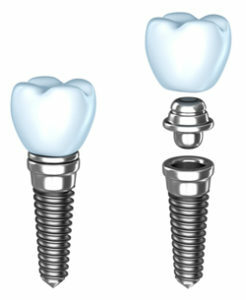 Dental implants also require a healthy jawbone to serve as a strong anchor to the implant post. Your dentist can tell you if you have enough bone mass to receive an implant. Healthy gums are also very important for implant viability – your dentist should evaluate the health of your gums and recommend if dental implants are right for you. Your dentist will complete a thorough dental exam. During this exam, your dentist will take detailed X-rays and create models of your teeth and mouth. After this exam, your dentist will create a treatment plan that takes into account which teeth need to be replaced, the condition of your jawbone, and your general oral health. Once this plan is in place, your dentist will schedule the implant procedure. Dental implants are a surgical procedure, so they will require anesthesia. Simpler dental implant procedures may only require local anesthesia, but more complex procedures may require that you go under general anesthesia. Before the procedure starts, you will be anesthetized. Your damaged tooth or teeth are removed. Your jawbone is prepared for the implant posts – this may involve bone grafting. Your jawbone will need to heal after the preparation. After this healing is complete, your dentist will install the metal implant posts into your jawbone. Another healing period is necessary after this step. This might last several months. After the implant posts have healed, your dentist will place the abutments in the dental implant posts. These abutments are the small metal extensions that connect the dental implant post with the replacement tooth. After the soft tissue of your gums have healed, your dentist will make molds of your teeth and jawbone and create synthetic teeth to fit your mouth. Once these synthetic teeth are created, they can be connected to the abutment and attached to the dental implant, completing the procedure. As you can see, this process takes several steps and requires healing time in between many of the steps. The complete dental implant process can take several weeks or several months to complete, depending on the complexity of the procedure, how many teeth are replaced, and the time it takes for your mouth to fully heal. Dental implant procedures fall into two general categories: two-stage, and single-stage implants. In a two-stage implant procedure, the first stage involves a surgery to place the implant post into the jawbone. The gum tissue is then stitched closed over the implant post to allow for healing. A few months later, a second surgery is performed to reopen the gum tissue above the implant post and attach the abutment and replacement tooth. Two-stage procedures usually involve endosteal (also known as endosseous) implants. Endosteal implants are placed within the jaw bone, and can attach to abutments via threaded screws, smooth cylinders, or bladed connectors. A single stage implant procedure involves a longer implant into the jaw. This type of implant leaves the top of the implant post even with gum tissue, and the implant head remains exposed during the healing process. This process is called single stage because only one surgical procedure is required. Abutments and restorations can be attached to the exposed implant post after the healing period, with no need to reopen the gum tissue. Standard Platform – Vary between 3.5 millimeters to 4.2 millimeters in diameter. Primarily used in the front of the mouth. Wide Platform – Vary between 4.5 millimeters and 6 millimeters in diameter. Primarily used in placements in the back of the mouth. Mini Dental Implants – Vary between 2 millimeters and 3.5 millimeters in diameter. Used in situations where a patient’s bone density is insufficient to support a larger implant, or when there is not enough space between tooth roots to accommodate a larger size. Dental implants fuse with bone over time, so they are a more permanent solution than other dental procedures. Temporary dental appliances like removable dentures or bridges can slip and affect speech or eating. Appliances supported by dental implants do not slip, so they do not interfere with speech or chewing. Dental implants offer more comfort and convenience compared to other solutions, since they do not need to be removed regularly. Maintaining dental implants is much easier than keeping up with bridges or dentures, that require special cleaning solutions and adhesives. The cost of dental implants varies depending on how many teeth you will have replaced, what type of dental implants will be used, and the bone quality in the area of the implant. A safe estimate is about $2,000 to $4,000 per tooth, or up to $20,000 to $40,000 if you’re having multiple teeth replaced. For more details on dental implant pricing, see our blog post on estimating the cost of dental implants. If you're worried about the cost of dental implants, don't be! We have several discounts and financing options available to help you afford your procedure. One major advantage of dental implants is the ease of maintaining them. Caring for dental implants is much the same as caring for your natural teeth. Brush and floss twice a day and keep regular appointments with your dentist for professional cleanings and checkups. Your dentist may also recommend special cleaning aids to care for the synthetic implant material. If a deep cleaning is needed, your dentist can remove the abutment and crown of the implant to take care of any issues. Ready to take the next step for dental implants? Call us today at (360) 253-2640 or use the contact form on this page to schedule a free consultation at our Vancouver, Washington office.